There has been so much said on Gold these days, investors are confused whether to buy or Sell Gold. I will try in my own way to confuse further!!!! Before trying to get to know what to do with Gold., lets try to find out WHY we should consider Gold as an investment class at all. 1). Its well known that Gold is a perfect hedge against Inflation. But. Period. at least 10 years. The fact that Gold has appreciated by 60% this year only makes it more obvious candidate for Long Term Investment only. 2) Gold is considered as a symbol of Wealth. 2) Gold is a good Diversifier. Gold tends to go against Equities and Real Estate and acts as a good hedge. public can't buy Gold, is considering lifting the ban. This move will make the Chinese Demand for Gold to go through the roof. 4) Gold Production is decreasing. Another reason for the Gold Prices to keep steady, if not go up. Inspite of a rapid rise in Gold prices, the production of Gold has Declined by 9.8% since the peak production seen in 2001. 1) There has been a sharp rise in supply of Scrap Gold which has had a 'soothing' effect on Gold price rise. The Scrap Gold supply is expected to rise further which will limit any rise in Gold prices. The Price of Gold has risen too much and at much quicker speed than one expects from a 'lazy' asset. This could bring in not only 'profit booking' but also 'shorting' traders bringing the prices of Gold down. 3) Rise in other commodities could dampen the prices of Gold. Especially, any price rise in Crude will hasten the hedge funds and 'fence' investors to jump away from Gold. Indians are major believers in Gold Jewellery. Gold Jewellery also has an added cost with the 'making' charge added to your Gold cost. Gold Jewellery has a unprofitable resale value and if you buying Gold for investment, then this from of Investment is Best Avoided. Gold ETFs are Gold Exchange Traded Funds which are listed and traded on Stock Exchanges just like any other stock. This is the Most Convenient Form of buying Gold and with its Low Cost, one can buy even 1gm of Gold. Gold ETFs also ensure that you do not need to worry of Purity of Gold, Security, etc. rokerage Charges, Securities Transaction Taxes, Demat Charges which 'eats' into your profit. Gold ETFs are Tax-efficient. ages with this form of buying gold is., not only the question over the purity of gold., but also the security of storage of Gold. ETFs., instead these Funds invest in Gold Mining Companies. These Stocks are very volatile, much more than Gold and tests your BP. If you stay rooted., then these two Funds give you MORE returns than the conventional Gold ETFs. erformed the FTSE Gold Mines Index which has given a return of 106%. These Two Funds also provide you Geographical Diversification due to their investments in Gold Mining Stocks Worldwide. However, do note, that these Funds not only face Equity Markets Volatility Risk but also Currency Risk. A Rash of Gold companies offered equities which had a sober effect on Gold Mining Stock Prices. This has now not only worn off but these Companies have outperformed the market by a Huge Margin. a shot in the arm to the 'bullish sentiment' towards Gold. Other Central Banks too are actively considering adding More Gold to their Kitty. Sri Lanka has already made an announcement to this effect. China has a 'measly' 2% Gold Reserves and is adding Gold quitely. While it will definitely not be 'win-win' situation for Gold Buyers., Gold will make a Good Investment, if you are considering holding the same for a period of at least 10 years. For now, you can use the Gold you have to take a "gold loan" to repair your house and any other expenditure as Banks will be falling over each other to offer you "gold Loan". Buy Gold at every dip and the 'sparkle' in your Investment Portfolio. With Gold in your portfolio you will not only 'sleep' well, but buying now, you will have to 'sleep' over it. Use Gold mainly as a diversification tool in your portfolio and NOT as a Core Investment. Do note, that unlike Equities or Real Estate, Gold does not bring any Regular Income and your income is 'locked'. Do NOT buy Gold from Bank. Not only the Cost of Gold you buy in Bank is higher, but the Bank only sells and does not buy back from you. If you remember, I had a given a STRONG BUY Call on Gold when it was quoting at $958 on March 19, 2009. 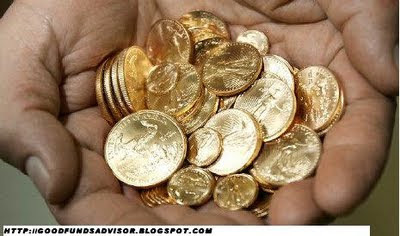 Click the link http://goodfundsadvisor.blogspot.com/2009/03/buy-gold-now-before-it-becomes.html" to see the article.